Each day, people board vehicles and consume medicines that could be dangerous if not for the strict quality control of the automakers and pharmaceuticals that keep us safe. Additionally, for companies at the cutting edge of development, it is imperative that they identify problems and formulate solutions prior to product launch. One of the ways companies can manage these risks is with fault tree analysis. 1. What is Fault Tree Analysis? Fault Tree Analysis, sometime abbreviated as FTA, is a methodology used to determine the probability that an unwanted event will occur. The “unwanted event” is typically considered to be some type of failure of a product, system, process, or an issue of any kind. The undesired events can be major, life-threatening incidents, such as the crash of an airliner; other critical events, such as a cellphone catching fire; or even less crucial failures, such as my personal drone crashing on landing. Fault tree analysis was conceived to simplify the process of risk assessment for commercial, medical, and public service organizations. So why use fault tree analysis? An FTA diagram can be used to identify a critical concern and its contributing factors and root events. Fault Tree Analysis enables you to model the safety and risk potential of events related to the failure of any type of system or process – from electro-mechanical systems to human errors in complex processes. Typically, an analyst or engineer employing FTA wants to assess the likelihood, or probability, of an undesirable event, and ultimately eliminate or minimize its occurrence, or mitigate its severity. In some instances, analysts may have a contractual requirement to ensure a critical event falls below a specific likelihood of occurring. FTA is a tool that can provide the metrics needed to meet this requirement. Fault tree analysis begins with the construction of a fault tree diagram. This diagram is a visual representation of events using logic gates. You start at the top level, by defining the main undesired event you are investigating. The events that could lead to the top event are then delineated, and are connected to the top-level event using logic gates that describe the relationship of events and their outcomes. The process continues until all basic events are identified. A fault tree diagram consists of Boolean logic gates, such as AND, OR, NOR, NOT, XOR, and Voting gates coupled with events, as shown in the example below. Once the tree is defined and the underlying event probabilities determined, there are various mathematical approaches to obtaining various risk metrics, such as the probability of the topmost undesirable event. Logic gates: Used to define the conditions in which a set of events will lead to a given output. For example, if event A is “failure of smoke detector” and event B is “shorted connection”, then the combination of event A AND event B will lead to a fire. Or, if event A is “brake failure” and event B is “deer in road”, then event A OR event B will lead to a crash. Risk measures: Values such as unavailability, or the probability that a system is inoperable at a given time, are used to quantitatively measure risk. Importance Measures: Indicate how much, or how little, a specific event contributes to the overall system reliability. Cut Sets: The sets of events that lead to the occurrence of the topmost event. These terms, as well as the shape and underlying meaning of the logic gates, should be understood to perform FTAs efficiently. 2. Who does Fault Tree Analysis? Engineers working on high risk or safety critical projects often perform Fault Tree Analysis. However, FTA is a widely used tool in a broad range of industries in order to measure the likelihood of an undesirable event occurring. Engineers, analysts, or any team member can capably perform fault tree analysis with a software tool. 3. When should Fault Tree Analysis be performed? Fault Tree Analysis should be considered any time you want to assess the risk and probability of an event you want to prevent. Oftentimes, FTA is employed in high-risk sectors, such as the nuclear power industry, and military and aerospace industries where mission success and safety is paramount. In some cases, in industries associated with highly critical outcomes, such as those involving loss of life or mission failure, fault tree analyses may be a contractual or regulatory requirement. However, FTA is used across industries because all companies have their own known risk, safety, and quality issues to address. For example, in our own company, our important issues may not be severe as those in the aerospace realm; however, we want to understand, assess, and measure software failures in order to prevent them or lessen their likelihood of occurrence. In some cases, fault tree analysis grows out of FMEA (Failure Mode and Effect Analysis). FMEAs are used to organize and assess potential failure modes of a design or process. While performing a FMEA, a potential failure mode may be identified as a particularly high-risk concern. This may be due to the fact that the results of the failure have a high severity, potentially occur frequently, and are difficult to detect. In this situation, it may be beneficial to more thoroughly evaluate this failure with a fault tree assessment. Fault tree analysis can provide more depth and specific metrics that simply are not available in a FMEA. 4. Where should Fault Tree Analysis be performed? Fault Tree Analysis is beneficial in a wide range of industries and organizations and is used in mission-critical industries in which user well-being and safety rely on an error-free operation. Some industries that rely on FTA include the nuclear power industry, medical manufacturing, and the aerospace and defense sectors. The adoption of FTA techniques in these areas has broadened its use across many market sectors. Other industries that have used fault tree analysis to aid in risk and safety assessment include telecommunications, automotive, locomotive, oil and gas, and a wide range of commercial and manufacturing businesses. How FTA is applied in various sectors is outlined below. All of these issues could result in plane crashes and passenger fatalities. 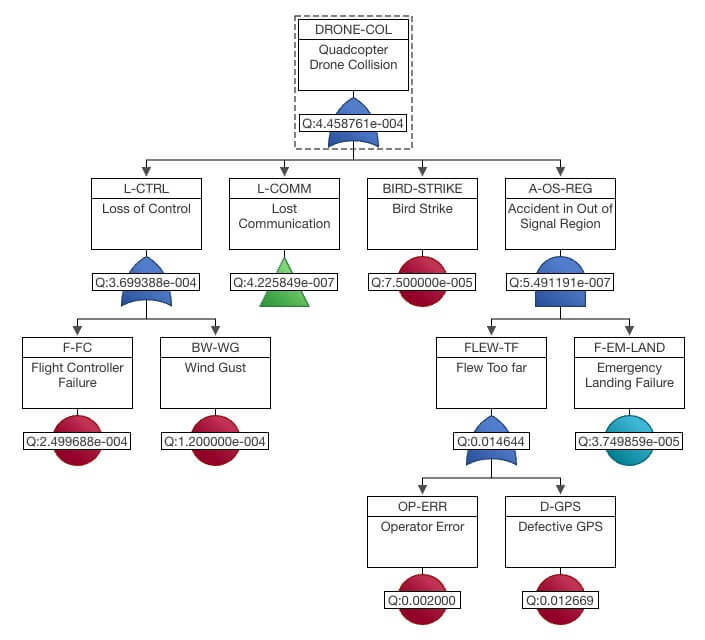 When aerospace engineers perform fault tree analysis, they can pinpoint the issues that lead to disasters like engine failure and then determine the possible underlying causes. Some of the most critical uses of fault trees in recent years have been in the automotive sector. Fault trees are vital in the automotive industry because they allow automakers to evaluate the risk of potential life-threatening events and determine ways to eliminate them. When you consider the millions of vehicles that pass along roads and highways every day, all across the world, countless lives rely on analysis techniques like the fault tree for vehicle safety. Each one of these features has tremendous potential to make the driving experience safer and easier for motorists. However, there are also innumerable problems that could arise with each function. Some of these problems would stem from mechanical issues while others could be due to human error, road conditions, or other external factors. In all of these cases, fault tree analysis can help uncover the possible issues of a given automotive function, as well as the events that could be contributing factors. Problems such as these could result in product recalls, lawsuits, and — in the case of infected products — outbreaks and fatalities. Fault tree analysis helps product engineers identify the contributing factors to these and other manufacturing related disasters. FTA software tools also help manufacturers iron out issues regarding shipments and transportation. For example, consider the prospects of launching a commercial business and then imagine its failure within the first 12 months of operation. In a fault tree, the top gate would be the failure of the business, while the contributing factors and potential causes would be represented as events connected with OR gates. Fault tree analysis uses have been put into practice in the defense industry to help weapons developers pinpoint numerous possible issues with military vehicles and artillery. In doing so, weapons manufacturers are able to rectify designer flaws and warn handlers of usage issues. Overall, this helps the military operate its defense weaponry with higher degrees of safety. Under the fault tree system, each of these disaster scenarios would be analyzed to determine contributing factors and root causes. If a quantitative approach is used, then the likelihood of the failures can be assessed to aid in prioritization of work to be done. Then engineers can determine ways to eliminate or mitigate the most critical risks. For example, if the weapon malfunctions at a critical moment, that would be the top issue in the tree. On the second row, the problems that could be responsible for the top issue would be represented by logic gates. A possible issue here could be a jammed handle. That, in turn, might be caused by a design flaw, which would be a root cause, represented in the tree as a basic event. Among weapons manufacturers, branches of the military, and law enforcement, fault trees are used to outline as many potential problems as possible and identify the contributing factors that could lead to critical events. Ultimately, these studies help prevent real-life catastrophes, and thereby, keep everyone safe. Any of these issues can result in real patient harm and possibly loss of life. Issues like these could have several contributing factors, each of which could have one or more root causes. With a fault tree diagram, medical professionals can break down each potential disaster scenario and identify all of the possible causes. Overall, this helps doctors improve their understanding of human health and reduce the risk factors associated with various medical procedures. The issue of watery oil could stem from several different source problems and root causes. The same holds true for gasoline that has not been stripped of impurities. In any case, fuel impurities degrade the engine health of automobiles, aircraft, rolling stock, and commercial transportation vehicles. Fault trees help the fuel industry reduce occurrences of these issues and retain good standing with the public. Instances of such issues could lead to loss of business, and a lot of customer complaints and dissatisfaction. Fault tree diagrams help telecommunication engineers identify the contributing factors and underlying causes of network failures and minimize their occurrence. 5. Why should Fault Tree Analysis be performed? Proven technique: Fault tree analysis is an accepted, proven technique for risk assessment. Fault tree analysis has been done for major, world-known failures such as the explosion of the Columbia space shuttle and the Deepwater Horizon incident. Clear metrics: Unlike other qualitative analysis tools used in reliability assessments, fault tree can provide clear quantitative metrics. Having measurable outputs is a significant advantage of FTAs. Comprehensive analysis: Fault trees can be as comprehensive as you desire. In some cases, fault tree diagrams can become incredibly large and fully detailed. The depth of evaluation is up to the analyst, but the ability to dive deep and get a thorough understanding of the issues at hand is a significant advantage of fault trees. Easy to understand: While the underlying mathematics is complex, the diagrammic representations and output metrics of a fault tree are easy to comprehend and explain to anyone. This make FTAs a powerful tool for engineers for their immediate task at hand, as well as for explanations to managers, department heads, and any team members who need to understand the risk assessment. Continual Improvement. Fault trees can be part of continual improvement efforts. As previously stated, fault trees can be performed as an outgrowth of a FMEA. So fault tree can be employed during the design phase, during the production phase, or as a post-mortem of a catastrophic failure occurrence. Any lessons learned from fault tree analysis can be used to aid in future designs or future process improvement initiatives. Overall, the advantages of FTA make any possible learning curve well worth the effort. 6. And the H: How do I do Fault Tree Analysis? What failure do I want to avoid? What is the possible magnitude of the failure? People process failures at different levels. In the minds of some people, a slow week of business is considered a “failure.” For others, a product that moves 500k units instead of a million is considered a “failure.” Some people, by contrast, would consider a “failure” a complete collapse, such as when an engine dies, or a retailer goes out of business. In other words, the failure to assess with FTA is specific to you, and whatever you deem a failure. However, in all cases, fault tree analysis is performed in the same manner. Once you determine the failure to evaluate, the next step is to break down the possible contributing factors. For example, if the fault is “product supply lingers on the shelves,” the intermediate gates in a fault tree diagram could include the factors that might cause a product to underperform, such as a new competitor, or changing market trends. As another example, if you are analyzing a computer crash, the intermediate gates could include hard drive failure, motherboard failure, or a system virus. In this example, you have three top issues that could ultimately cause a business to collapse, each would be represented by an OR gate, meaning any of the events individually could lead to business failure. Each gate is then expanded to ultimately identify the lowest level causes. The first gate identifies the possibility of business failure due to lack of goods. If you do not have the items that people would hope to find in your store, they are less likely to return in the future. Low stock could be the result of poor management insight or an insufficient supply at the manufacturing end. The second gate analyzes the scenarios that could lead to poor sales. When considering reasons for poor sales, we can further delve into two critical areas leading to this problem: people not buying and marketing issues. Therefore, under poor sales, there are two sub-gates to represent these issues. The reasons people may not be buying the product may be due to the economy, the price, or lack of product appeal. In the second gate, local market factors are taken into consideration. For obvious reasons, a storefront could easily fail if it is located in an area that sees little foot traffic or has few nearby residents. A shop could also fail if it is situated in a community not inhabited by the target audience. The third gate lays out the possible issue of fiscal insolvency and its potential roots causes, any of which could be singlehandedly responsible for the collapse of a business. If a shop’s revenues are mishandled, there will not be enough money each month to cover rent, employee salaries and stock reorders. If monthly sales cannot cover costs, store closure will be inevitable. A shop could also be squeezed out of existence by rising rents, over-expansion, and other overhead costs. To an aspiring entrepreneur, the various factors that could lead to business failure may not be a top-level concern during the excitement of launching a new venture. Even if you do think of one or two possible problems that could cause your business to collapse in its first year, there could be 10 other issues that you never would have considered. With a fault tree, you can carefully consider all potential problems, have a clearer perspective on matters, and manage, or even eliminate, issues before they become problematic. Which events are likeliest to cause failure? Are there any events, in particular, that could spawn total failure through several different paths? Fault trees can be examined through the processes of qualitative and quantitative analysis. To perform a qualitative analysis, you examine the smallest group of problems with the clearest, most integrated pathways to the overarching fault. You can also make fault tree analysis probability calculations and do a quantitative analysis in which events are multiplied by their numerical odds. Once you determine which events could lead to failure, take action and implement procedures to reduce or even eliminate the possibility of those events you deem most critical or most likely. For example, if your shop is losing customers due to an unknowledgeable staff, hold training sessions to get your employees more able to handle customer issues and resolve problems. What Are the Types of FTA? Accident fault tree: An accident fault tree lists an accident as the top event and examines the possible causes. For example, if a commuter rail goes off its tracks, that would be a critical event to analyze. The intermediate events of this FTA may include issues with the track, the undercarriage, the driver, or possible roadway obstructions. Event fault tree: An event fault tree could identify top problems that may occur at a public event. For example, if an upcoming outdoor music festival could be the scene of fires, riots, and disorderly conduct, the tree might examine contributing causes — long bathroom lines, poor food choices, inadequate sound, uncomfortable seating, drugs — that might swell into public unrest. Process fault tree: A process FTA might examine the possible faults of mechanical processes, such as the functions of pneumatic tools. If an air-powered paint sprayer leaves streaks and blotches across the surfaces of cars and appliances, a fault tree diagram could help identify the source of the problem. Risk fault tree: A risk fault tree could be used to identify the risks involved in certain activities. A company that manufactures racing cars could use a fault tree to break down the various ways that a driver might get seriously injured on the raceway. 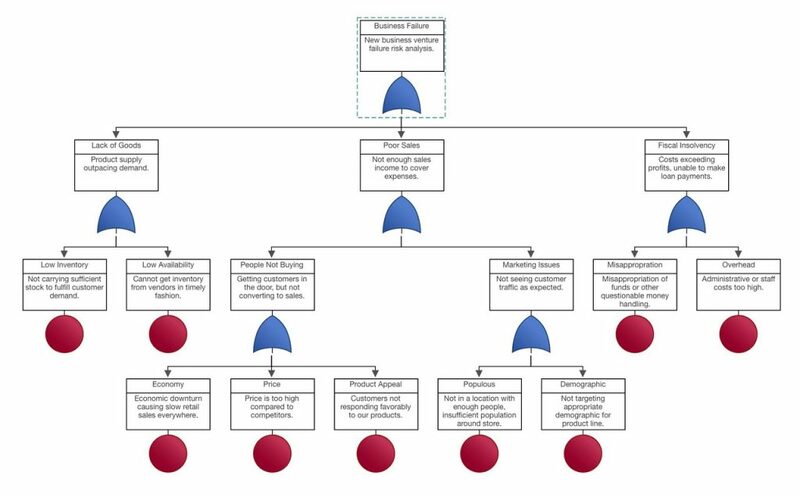 Safety fault tree: A safety FTA could be used to pinpoint weaknesses in the safety features of products, vehicles, and appliances. What Is the Purpose of FTA? The central purpose of fault tree analysis is to determine the possible causes of a system, product, or process failure before it occurs in order to prevent its occurrence, lower its probability of occurrence, or minimize its effects. In a qualitative fault tree, the root cause paths that ultimately lead to a failure are evaluated. A quantitative fault tree takes the analysis to another level by employing statistical methods to assess the probability of the failure event occurring. FTA is based on the premise that product and performance faults can result from one or more contributing factors from a range of potential problem issues. Fault tree diagrams use the concepts of Boolean logic (logic gates) to properly combine separate fault events. For example, a plane could fall to the ground if it loses both engines. A plane could also fall if one of its wings is damaged in a mid-air collision. The intermediate events leading to a plane crash would be “duo-engine failure” or “mid-air collision,” represented as two events connected by an OR gate in the fault tree diagram. If a failure results from a combination of two events occurring together, then an AND gate would be used in the fault tree diagram. For example, if a plane crashed due to a grease-saturated engine and a faulty backup engine, the events could read “impaired engine” and “faulty backup,” connected by an AND gate. What Standards Are Most Important When Performing a Fault Tree Analysis? There are a number of commercial and industry standards for fault tree analysis, such as versions of NUREG-0492 for the nuclear power and aerospace industries, SAE ARP4761, MIL-HDBK-338, and IEC 61025. However, you do not need to employ one of these standards to perform FTA. Fault tree analysis is widely accepted, especially in the reliability engineering field, and therefore there are many sources to use as guidelines including several books, publications, and reference materials which describe performing fault tree analysis. Fault Tree Analysis is also used to support other quality related efforts that may be standards-based. For example, FTA may be part of an ISO 9001 quality assurance program or used as a tool to meet requirements for the FDA (Food and Drug Administration) or even employed as part of ANSI (American National Standards Institute) compliance. Fault Tree Analysis enables organizations to support their risk assessment or quality compliance efforts in a variety of ways. For this reason, FTA is a widely recognized and accepted technique for risk analysis. Whether your FTA is done in order to meet guidelines, or compliance requirements, or your own internal goals, it is a well-established and useful tool to employ. 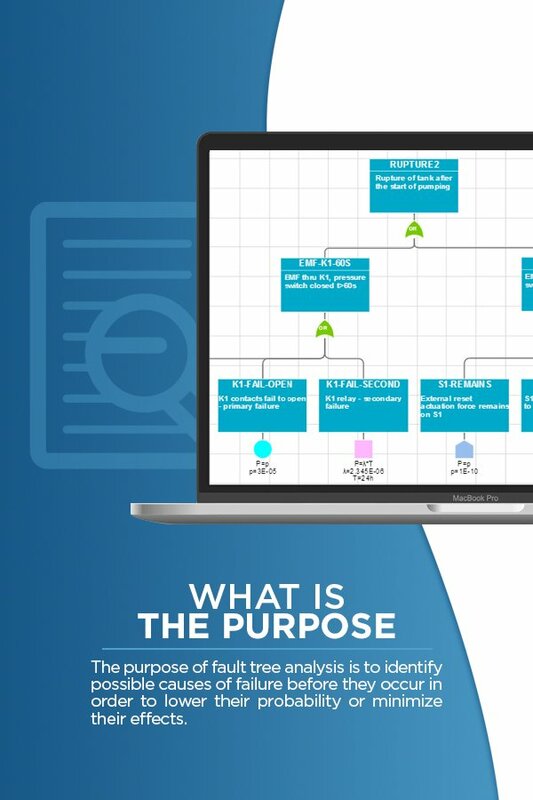 If you are new to Fault Tree Analysis, you can learn about the methodology underlying FTA by reading available publications, as well as standards that are used in industry. Is there an Easy Way to Perform Fault Tree Analysis? Once a fault tree diagram is constructed, the mathematical computations can be performed manually, but can easily become too complex for that to be realistic. In some cases, analytical solutions are not possible, and simulation techniques must be used to obtain probability values. This is why using a software tool specifically designed for fault tree analysis is needed. A fault tree software tool, such as Relyence Fault Tree, is built to allow for easy and intuitive diagram construction, the creation of visually pleasing outputs, handle the complexities of calculations, employ optimization techniques, and provide the accuracy needed for clear assessment. To carry out a successful fault tree analysis, it is best to have a software tool that will enable you to work in an organized and easy-to-navigate manner. If you are wondering how to do fault tree analysis for your public or private organization, sign up for a free trial or FTA software demo with Relyence Software. Relyence Fault Tree makes diagram creation easy, and auto-connects and optimizes your layout. It also includes features to capably manage large trees, accurately perform high-level mathematical calculations, and produce high-quality outputs and reports. Learn more about Relyence Fault Tree, and test it with our completely free online trial, or check out some of our Relyence Fault Tree online videos. Feel free to contact us at 724.832.1900 to schedule a 1-on-1 demo of Relyence Fault Tree. We are here to help answer your questions!